Why Use Armstrong Optical Service? At Armstrong Optical we realize that you have a substantial investment in your office equipment. That equipment must be kept in the best shape possible in order for you to efficiently serve your patients. We assist you in this endeavor through our Preventative Maintenance Program. We will send you a friendly reminder when it's time to service your phoroptor, keratometer, projector, slit lamp, lensmeter, ophthalmoscope, exam chair, or any other area of your lane equipment. Call us to today at 903-463-2023 (toll free 800-627-5054) with any questions you may have or email us and someone will get back to you promptly. 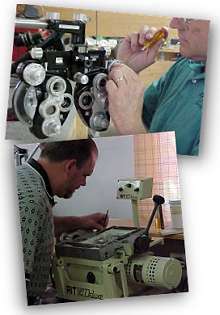 Armstrong Optical, your source for optical and opthalmic equipment service, repair and preventive maintenance programs.